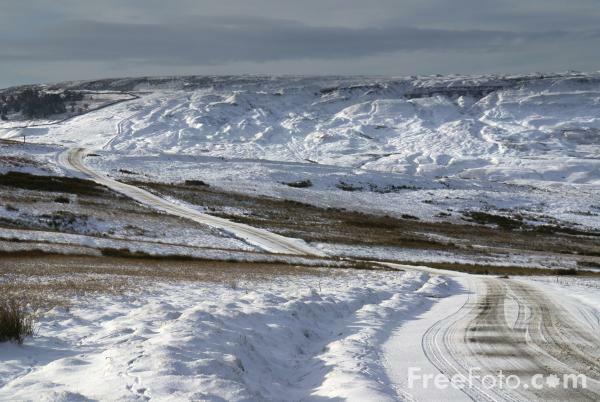 …last winter, myself and a friend found ourselves gasping our way up Lamps Moss in Yorkshire. There was a steady wind blowing, and as it whistled across the snow piled up either side of the road it threw spindrift in our faces, and found it’s way through hitherto unknown gaps in our clothing. When I say winter, it was actually March, but this was 2013 – the year of endless Siberian weather here in the north of England. I remember it was March because, co-incidentally, on that same day the pro-peloton was also struggling through the snow as they battled the elements at Milan San-Remo. It’s hard to say exactly why we were up on Lamp’s Moss on road bikes in such weather; lets just say there was a misjudgement, and then a bit of misguided pride involved. In hindsight, a flat ride in the valley would have worked just fine. Anyone familiar with Lamps Moss (www.northernbike.com, I’m looking at you) will testify that’s it’s quite a pull up that last quarter mile from the Kirkby Stephen side. As we crested the climb we came across an old-timer on a Sunday drive who had decided to turn off the road onto the grass, and-off road his way to a decent viewing spot…no, not in a Land Rover or similarly equipped vehicle, but a Ford Fiesta. Suffice to say that by the time we reached him he had revved his wheels deep through the snow and into the mud beneath, was now well stuck, and was looking at us through imploring puppy dog eyes. There was no-one else around, and we felt a long way from civilisation. Of course, we had little choice but to help the man. After much wasted time calf deep in snow, pushing, pulling, and digging with bare hands, we eventually got him out; me furiously gunning the engine as my mate stuffed the car’s floor mats beneath the wheels for traction. The man watched on – no help whatsoever, but very grateful. We waved him on his way, then cursed him repeatedly. We had now spent 30 minutes messing around in the wind and snow at the high point of our ride – dressed for cycling, of course (and if I’m honest, a little underdressed for the conditions). My mate’s lips had turned blue and he’d gone very quiet (he doesn’t do well in the cold) and I wasn’t much better. Having been drained of all body heat we were now faced with a traverse of wild moorland before we could dive headlong down a fast descent; not pleasant with hands like blocks of wood, wet feet, and generally chilled to the bone. But we pushed on, over the Buttertubs Pass, and reached sanctuary in the town of Hawes (home of Wensleydale cheese, no less) where we all but out-stayed our welcome in a café as we crammed warm things into our body. I have to confess, Garsdale Head (the mighty Coal Road) should have been our next port of call that day but we bailed out, and cruised down the valley back to our finish point of Kirkby Lonsdale (in the southern tip of Cumbria, in fact, practically Lancashire). On reaching Kirkby the sun was out, the grass was green and the birds were singing; we seemed to have descended into the next season (the correct season – it’s March, remember). And so a lesson was learnt – when out on a spring ride in future, I intend to always work on the basis that up on the moorlands of North Yorkshire things could well be a season behind. Oh…and always carry a shovel incase rescue is required. Thanks Northernbike. Lonely is right – i ride those roads 3 or 4 times a year and i’m always taken aback by how remote it feels, often just moorland as far as the eye can see and hardly a building or electricity pylon to break the view. It’s proper riding too, i certainly never seem to come across much flat, and some of the climbs are classics – Tan Hill, The Rash, The Coal Road, Fleet Moss – great stuff.